Wild orangutans in Borneo hold leaves to their mouths to make their voices sound deeper than they actually are, a new study shows. The apes employ the leaf trick when they are threatened by predators, according to scientists observing them. By holding leaves to their mouths, the orangutans lower the frequency of the sounds they produce. This is used to ward off predators, giving them the impression the apes are a bigger target. 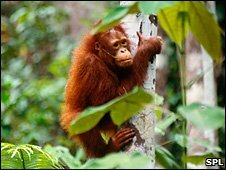 The international team made the discovery while observing distress calls made by the orangutans. The apes make the sounds in response to approaches by snakes, clouded leopards, tigers or humans. These distress calls are known as "kiss squeaks" because they involve a sharp intake of breath through pursed lips, producing a sound similar to that made during a kiss. But by using the leaves to modify the sound that comes out, orangutans deceive predators into thinking the calls are being made by a bigger animal. Co-author Madeleine Hardus, from the University of Utrecht in the Netherlands, told BBC News: "This study clearly indicates that the abilities of great ape communication have been traditionally undervalued and that there may be traces of language precursors in our closest relatives, the great apes." She added that the findings suggest that primate calling behaviour is not purely based on instinct, but instead is socially learned. Primates have often been observed using tools to obtain food. But cases where tools are used to modify sound are not well documented. Madeleine Hardus explained how she and her colleagues followed the apes through the swamps of Kalimantan in the Indonesian part of Borneo. Pointing a microphone to the canopy to record the sounds they made, the researchers also observed how the apes used their calls in their ecological environment. Kiss-squeaks can be given in three different forms, the authors wrote: using only the lips, or with either a hand or leaves in front of the lips. Using a sound studio, the team analysed the recorded calls and found that these three forms were acoustically different from each other. "The maximum frequency (Hz) of the kiss-squeak using leaves was the lowest of the three," Ms Hardus explained. "As kiss-squeaks in orangutans are related to body size, this showed that the ones using leaves exaggerated orangutans' size by lowering the sound frequency. "Because it is very rare and difficult to get a full view of an orangutan in its rainforest habitat, this could be very advantageous, since a potential predator will have to rely more on sounds than sight in these conditions," the Dutch primatologist continued. Evolutionary psychologist and chimpanzee expert Professor Andrew Whiten of St Andrews University told BBC News called the study exciting. He said it explained the use of leaves to perform the kiss-squeak as a local, socially learned tradition. Apes can learn much about how to use leaves and other tools by watching others, he said. Dr Whiten pointed out some parallels with the behaviour of chimpanzees. They also modify their calls, so that they are similar to members of their own community and different from those of other groups. Different communities of chimpanzees "clip" leaves noisily with their mouths in different contexts, such as courtship, the professor explained. "Apes appeared to have much more voluntary control over their hands than their voices and facial expressions," Professor Whiten continued. He cited a widely known example of a chimp which used its hand to hide its involuntary grin from a rival.